We have five beautifully decorated luxury bed and breakfast rooms in the main house, all on the second floor along with two efficiency units, located on the ground floor. Our rooms have private baths en suite, cozy bathrobes, hairdryers, alarm clock/radio, sound machine, central air conditioning (window air conditioner in the efficiencies), separate heat controls, outgoing telephones, free wireless Internet and access to the outdoor hot tub. All the essentials for your comfort are available in your rooms, including extra pillows, blankets and towels. The efficiency units, The Darcy and Garden units, have a mini kitchen for guests to make breakfast or snacks during their stay. The kitchen comes equipped with a refrigerator, microwave, toaster, coffee maker, hot water kettle, dishes, glasses and flatware. Brekfast is not included. The Jefferson Inn provides complimentary coffee and tea. 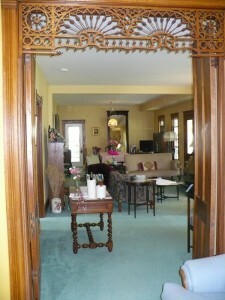 There are two sitting rooms in the Inn to socialize with other guests or friends. In the main living room you will find a gas fireplace along with couches and easy chairs. A wet bar has been set up for your enjoyment. Complimentary tea, coffee, water and soda pop are available along with the daily home baked sweet. A refrigerator is available for your use along with barware and serving dishes. The second sitting room on the main floor doubles as a TV and game room. DVDs and games can be found in the converted antique sideboard. For those guests staying in the luxury B&B rooms of the old house, a full gourmet breakfast is served each morning from 8:30-9:30 a.m. in the dining room. Start your day with our rich flavorful coffee, specialty teas, fruit juice, fresh fruit and homemade muffin/bread/baked good. Each day a complimentary new hot meal awaits you. Awaken your senses with the smell and taste of one of our Inn specialties, such as Blueberry Stuffed French Toast, Sweet Soufflés Topped with Raspberry Sauce and Fresh Fruit, Eggs Benedict or perhaps a Ham and Swiss Strata! 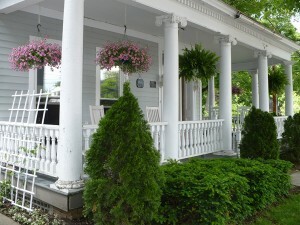 Our hot tub and outdoor porches are available for your relaxation. The hot tub is located on the back porch and is open year round. There are several porches for your use. The wrap around covered porch has rocking chairs along with an antique wrought iron table and chairs to chat with friends, read a book or sip on a glass of wine. Perhaps a game of croquet is in order. You’ll find a croquet set on the wrap around porch. The efficiency units have their own porch with wood high back chairs. Just off the porch is a picnic table and chairs with a market umbrella to keep you in the shade. The back porch has the hot tub along with a table and chairs and shade umbrella. The Inn has a storage room for your skis and bikes.